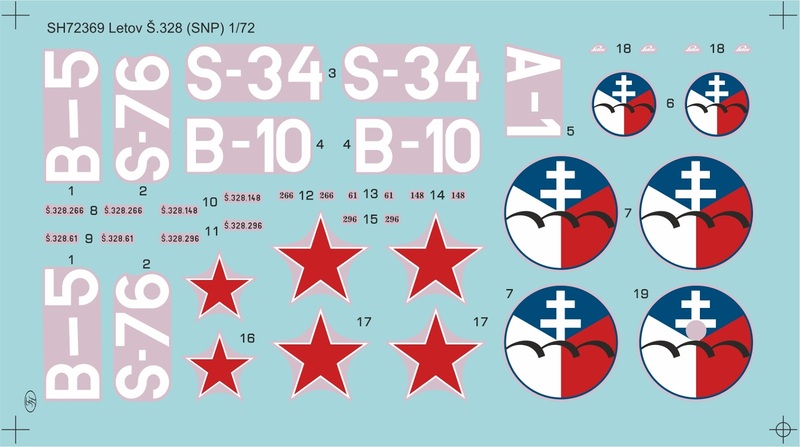 The Letov Š.328 “Slovak National Uprising” kit in 1/72 scale is to be released early this September to commemorate this important event of Slovak WW2 resistance which broke out at the very end of August 1944. 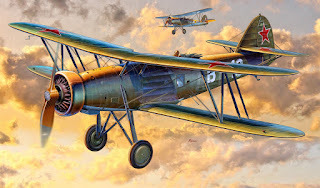 As the insurgent forces operated Letovs of various series with both aluminium and plywood skinning of their rear upper fuselage, the kit will also contain both styles of the fuselage and wing. Letov Š.328.266, B-10, Tri Duby air base (presently Sliač), Combined Squadron, Slovakia, September 1944. The machine was heavily used during the uprising and also wore non-standard national insignia. The red, hand-painted stars the rather worn out aircraft wore had been applied just because the machine was flown on liaison duties over the front. 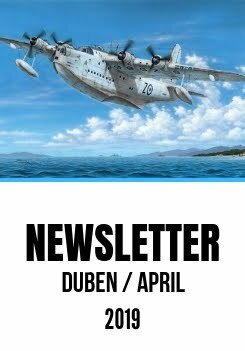 However, it saw some real action too and on several occasions it got back to the base with bullet holes in the fabric skinning of the wings and tailplanes, requiring repairs and even replacement of the elevators. Letov Š.328.61, S-76, Tri Duby, Combined Squadron, Slovakia, late August 1944. 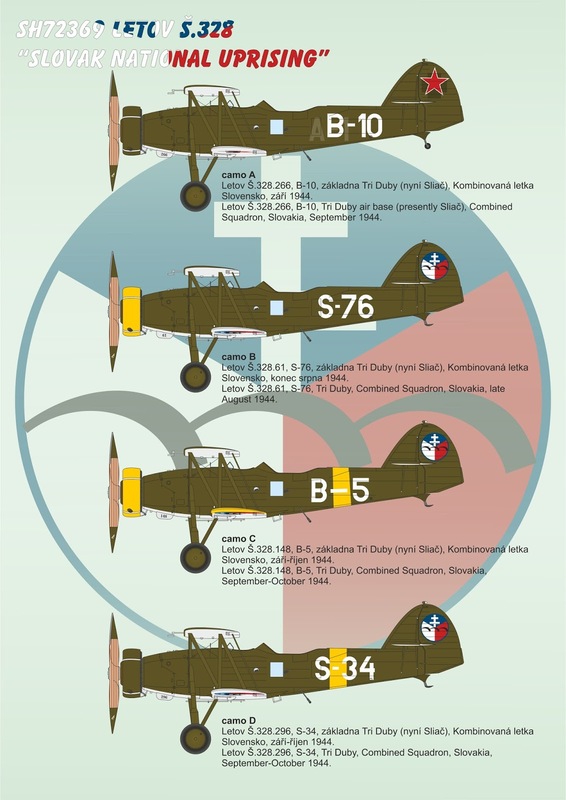 This first series machine featuring metal fuselage skinning was a true warhorse, and also most possibly the very first airplane to receive national insignia of the insurgent forces, these being the original, pre-war Czechoslovak roundel with an added motif of a white patriarchal cross and three peaks. The plane was destroyed on 31 August 1944 during a German air raid against the insurgent base. Letov Š.328.148, B-5, Tri Duby, Combined Squadron, Slovakia, September-October 1944. During the uprising, B-5 was used for combat missions. The intense service and also usage of several airframe components from other machines was noticeable on this plane’s finish. Various crews were reported to have flown this plane, for instance on 17 September 1944 a crew of J.Kúkel and L.Haim successfully attacked enemy artillery battery near Opatovce. For sergeant J.Kúkel, his involvement in the uprising was the starting point of his steep military career. In the post war Czechoslovak Air Force, Kúkel would become a top jet pilot, achieve the rank of Lieutenant General and would also reach the post of a commander of the 10 Air Army only to be put to reserve in 1971 for his disapproval of the Warsaw Pact “friendly armies” invasion of Czechoslovakia in August 1968. Letov Š.328.296, S-34, Tri Duby, Combined Squadron, Slovakia, September-October 1944. A dual control machine that had been operated in the training role by the Slovak State Air Force (SVZ). 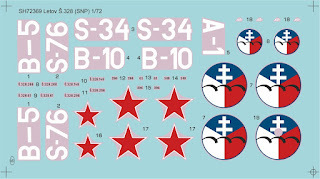 Following the break out of the Slovak uprising, the aircraft was converted back to combat standard and flown by various crews until 25 October 1944, when Tri Duby airfield was abandoned because of the advancing German troops. The aircraft is reported to have been flown in an armed recce mission by a crew of A.Soldán and L.Haim on 19 September.